[ Сообщений: 303 ] На страницу Пред. 1, 2, 3, 4, 5, 6, 7, 8 ... 11 След. Итак теперь обсуждаемая компания обвиняет русское сообщество в гонениях, гомофобии, травле и как ни смешно "жажде их смерти". Русское сообщество отреагирует? Русское сообщество пока в шоке и обтекает. Ну что ж, здесь компания не сочла возможным ответить на вопросы, зато теперь они "really need the support of the worldwide BJD community". Может быть, и правда русскоязычные площадки не для них? Отличный вопрос для руководства этих площадок. Что ж, поживем увидим. Жаль что не все помнят старую истину - если ты плюнешь на коллектив - коллектив утрется, если коллектив плюнет на тебя ты утонешь. Утрёмся ли? Мне теперь интересно, все эти люди, которые так рьяно вставали на сторону резонансной фирмы, таки прозреют или продолжат защищать безвинно гонимых, пока сами ушат говна не получат? Итак тему снесли но скрины считаю необходимым принесть. 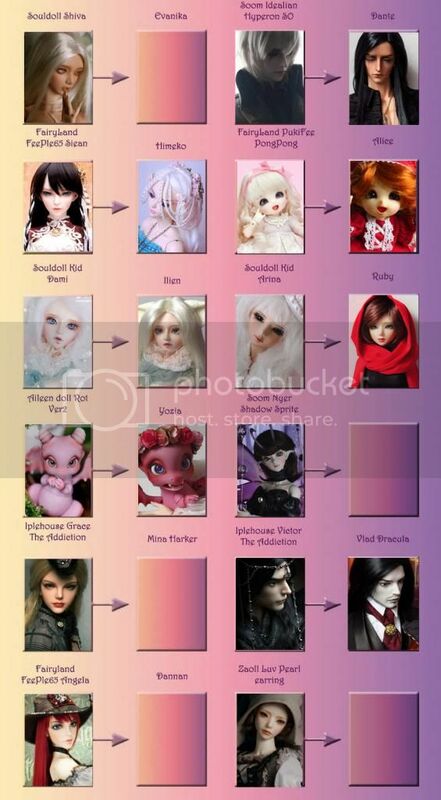 We are Georgy and Kate Ramensky, we are also known as Amadiz Studio, we are very sorry that we have to ask for help, but we really need the support of the worldwide BJD community. We do not like conflicts and have been silent for a long time about our problems, trying to endure this terrible situation, but now we are forced to tell you the whole truth, because our physical and moral strength is running out, we are forced to use antidepressants and suffer constant torments. Since August, 2017, we and even our five-year-old son have been subjected to cruel humiliation, insults and psychological pressure from the initiative group of haters from the Russian BJD community. A seamstress, dismissed from our company last year, became the orginizer of this persecution. She is known as @Kotyan and Vasilisa Workshop (on Etsy). We took it to work in May 2016. She was fired in July 2017 after I accidentally saw her insulting correspondence in social network with another employee, where they discussed how they want to leave our company and stop our work in order to create their own business. So it was said that "Georgy piss me off". We honestly confessed to @Kotyan that we know everything, and offered to discuss this issue, because we considered her all this year a friend, dined with her at the same table and did not know that she hates one of us. She made a scandal and left. Unfortunately last months @Kotyan worked very badly and did many non-quality things in our company. 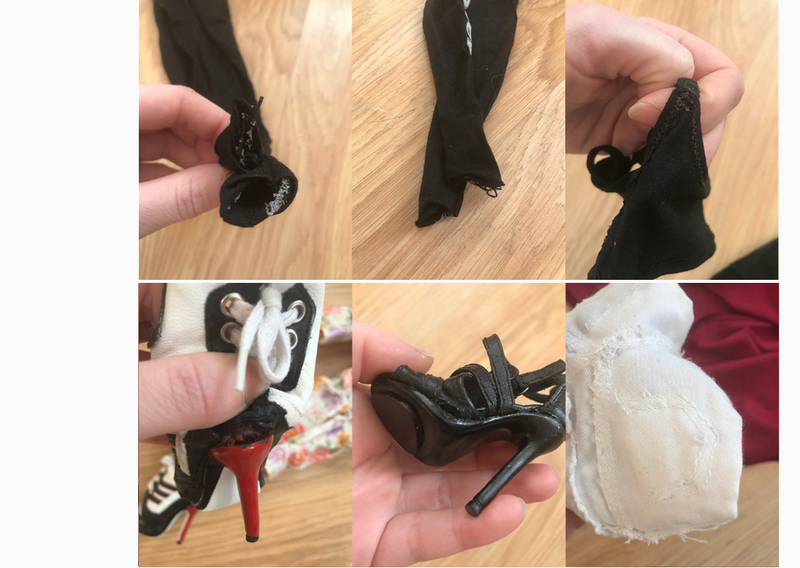 We had refunds from our customers (things were torn, did not fit the dolls). 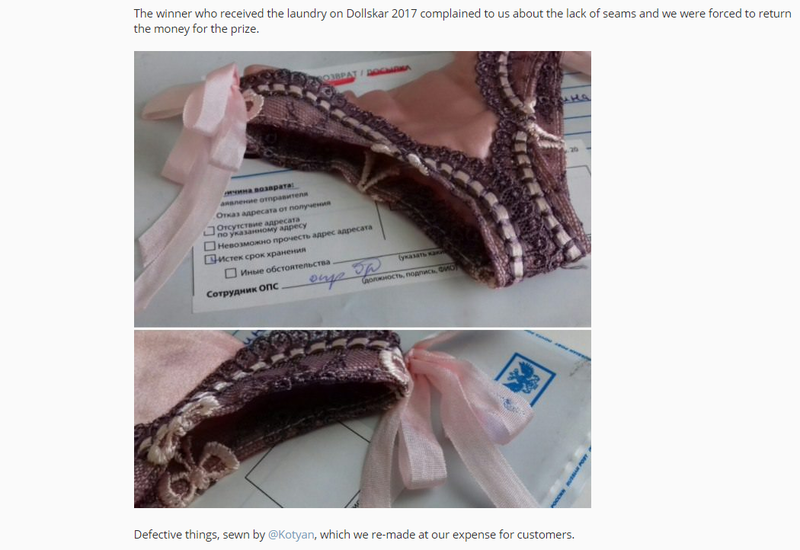 We always gave a lot of prizes to the bjd party and now the russian winners also were dissatisfied with the quality of things and we refund them money for prizes. It turned out that the clothes have no seams, it was just glued. 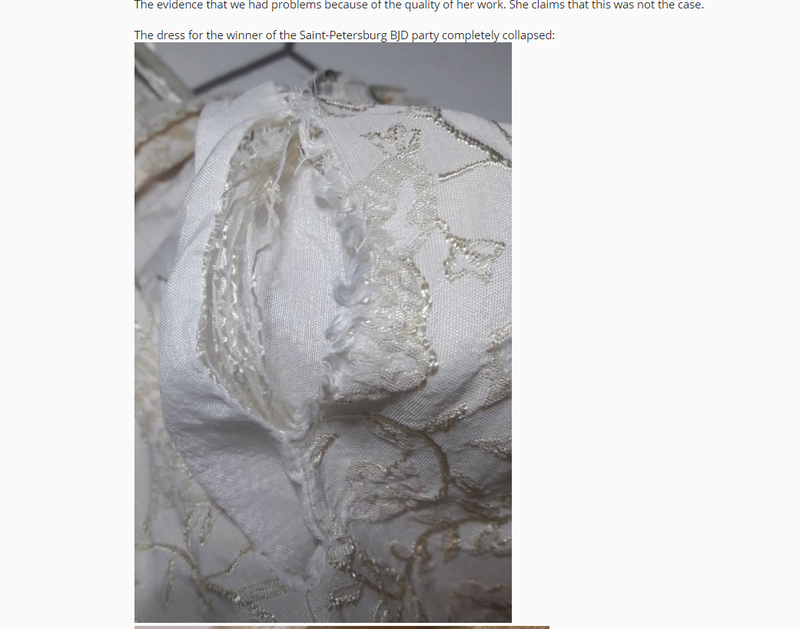 We did not notice this, because Georgy not a seamstress, we completely trusted my dear emploee for a year of work and treated very well, and even when the problem started we never spoke with her rudely and always supported. After her dismissal, she created an anonymous community on the tumblr and in the Russian community and began actively spreading slander about Amadiz Studio. She said insane things that we sew from poor-quality old fabrics and from dirty rags for washing the floor. It was monstrous. But we understood that no one would believe in this and ignore her behavior 7 months. We still have a large number of poor-quality things sewn by @Kotyan, which we can not now sell or even use. 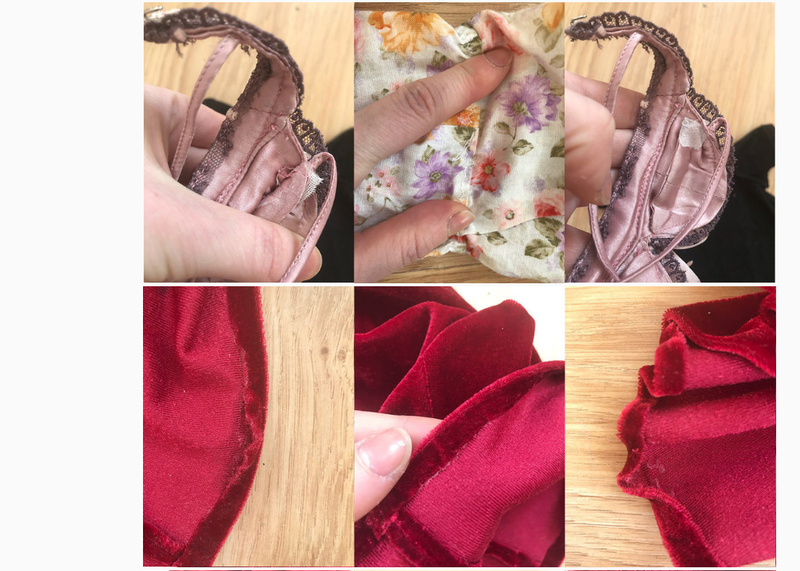 We repeat, we did not notice the defects, because she was the first pofessional seamstress (she said about her seamstress education) we hired and completely trusted her. We did not check her work carefully, completely trusting her, because in the beginning she worked well and we really adored her things. Now we also did not want to demonstrate poor performance of @Kotyan, but this woman began to persistently pursue us and threaten our, our business and our family. 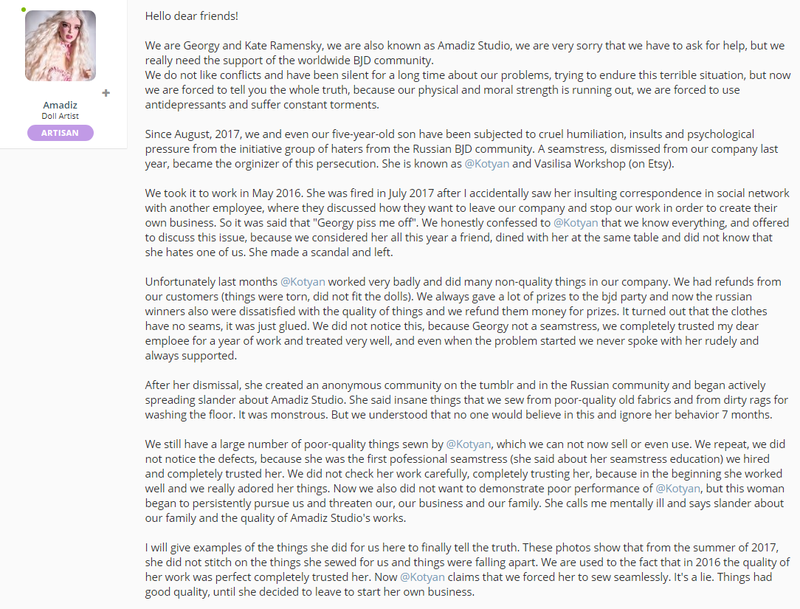 She calls me mentally ill and says slander about our family and the quality of Amadiz Studio's works. I will give examples of the things she did for us here to finally tell the truth. 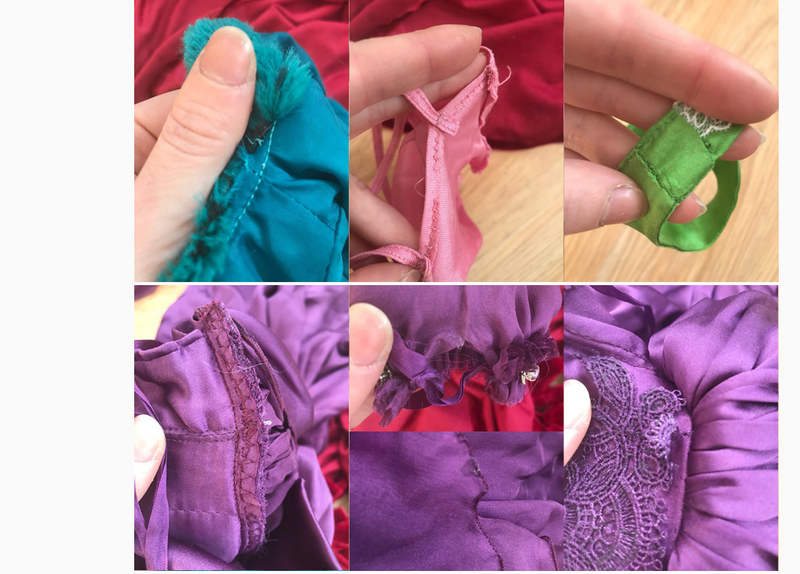 These photos show that from the summer of 2017, she did not stitch on the things she sewed for us and things were falling apart. We are used to the fact that in 2016 the quality of her work was perfect completely trusted her. Now @Kotyan claims that we forced her to sew seamlessly. It's a lie. Things had good quality, until she decided to leave to start her own business. All these things made by @Kotyan for Amadiz Studio. We paid money for it and never claimed. We would never have talked about this if this woman had stopped in her hatred of us. As you know, we have been making wigs for dolls for many years, but a year ago we created our first doll. We received a very positive feedback from the worlwide community to our work, but people from Russian community began to offend us and our creativity. It was our first creation and we loved our work very much, and put our heart and soul into it, trying to create a doll that we like. But we was a beginner artists and our first work was not perfect. we saw her imperfections and constantly made corrections and renew, trying to make our dolls better and better for us and our dear customers. We decided to casting our dolls ourselves and learned it, we bought equipment and dedicated with our own forces to this difficult work. At the very beginning, our result was not as good as we expected. We worked with "french" resin (semi-transparent) with very short pot live and degassing did not work very good. We could not make perfect castings without bubbles from this resin. In addition, it was very difficult for us to make sending on translucent material, seams was very poorly visible and there could be scratches. This doll on the photos of Kotyan since Spring, 2017. After almost a year after buying this artist doll in February 2018 she said that we deceived her and the doll was defective. She saw her doll for a year and suddenly found that she had scratches from the sending. She sewed clothes for her for a year and played with her, in particular using as a model for her Vasilisa workshop. 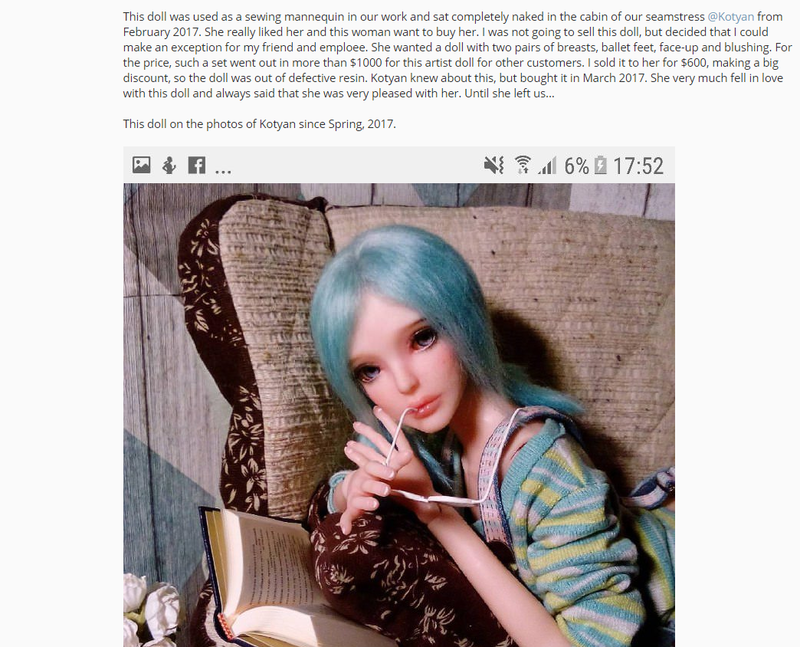 She started calling us scammers on russian bjd club and pretending to be a victim, after so much time, seeing her doll every day. She showed everywere these photos with scratches on her doll. If they are so horrible how she could have missed them the whole year? Learning about this, we immediately apologized for the unsuccessful sending on this doll, because we also did not notice these scratches and they were not noticeable under the blushing that other our employee made too. @Kotyan roughly refused our help in public communication on Russian BJD club, saying that she did not want to communicate again with us. She easily polished the scratches of the doll and show the picture. But she found hidden bubbles in the legs. This was the reason why we refused this resin. We were not satisfied with the quality of this casting and she knew that the doll was from defective resin. 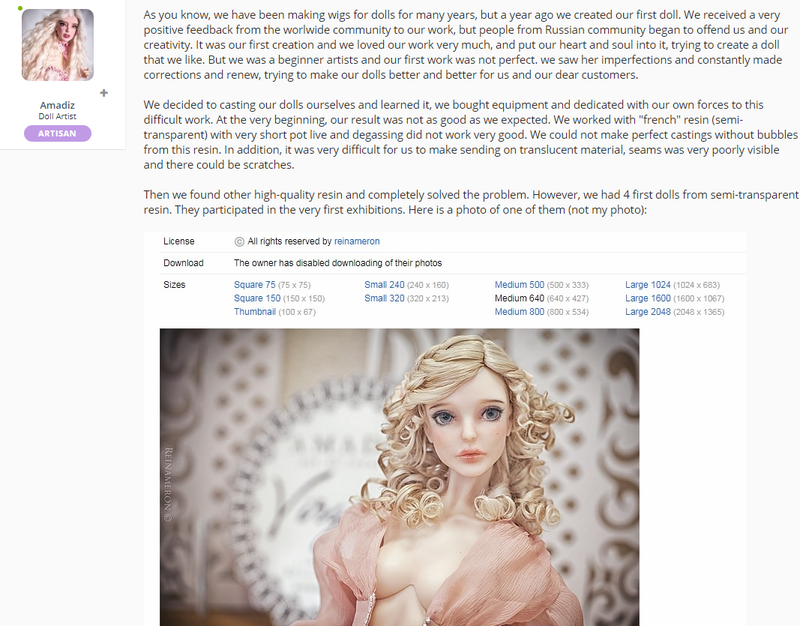 Then Kotyan began to bring photos of her defective doll everywhere, to say that she was our disgruntled client and we were making only defective dolls, although her doll was given to her without a certificate and a box, and she took it on the same day, and paid her a convenient layaway plan. She came to us in our Instagram and began to demand that we simply give her money without returning the doll, as we deceived her, and the artist doll, bought at a discount, should cost even less. She just began to extort money from us, claiming that she very much loves this doll, but hates and despises us. I wrote, she spoke a lie and again offered a solve of her problem with doll. But she continued to write slander and I had to banish her. - she lied that I did not create my own dolls and spread this information on the Internet, starting in September 2017. 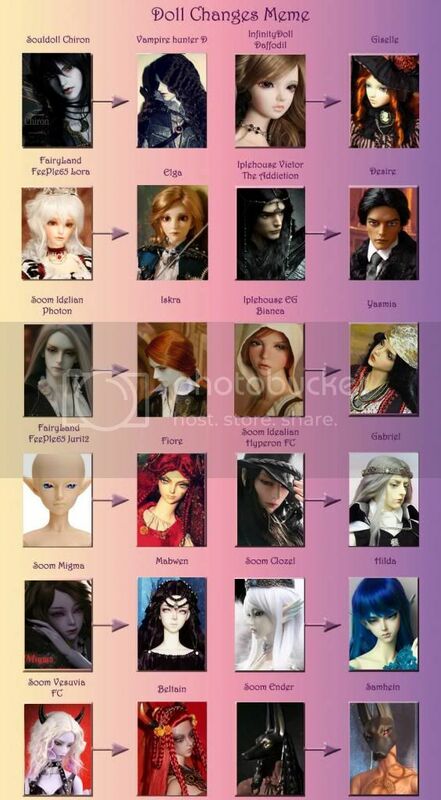 I could easily prove that this is a lie, and I create all my dolls myself, some from Magic Sculpt, others with 3d. The majority believed my evidence. We are very tired, but we continue to live and work in terrible stress because of constant persecution of the initial group of Russian haters who spread slander about us. Our mentaly and phisicaly state of health are very poor now, there are problems with the schedule of making our dolls. We are so exhausted that we can hardly do the job that we loved most in life. But these people with Kotyan will not be able to stop us, even though they threaten to destroy our business and reputation by any means. We know that people who have been stalking us for a very long time could come here. For example, Vlastelin Nichego (one of BJD club moderators) and @Izrafer, who have persecuted and insulted us for 5 years, and will begin to say that all this is not true. But all this time, I did not offend anyone, I always apologized for my mistakes, I looked for solutions to any problems for my clients and helped everyone who contacted us for free. Over the years, we have successfully completed more than 1500 orders for our customers. And our reputation and service were very good. Even after all this, I'm still ready to help @Kotyan, although I'm not guilty of anything. I am ready to make a new doll for her or to return the money completely for this one. But she does not need help, she needs to create a hype and gain popularity due to the fact that she tries to blacken us. We will not let her destroy our life, work and creativity, which are so loved by us. I can not keep silent any longer, it has been going on for 7 months already and I ask for your help, I ask you to stop this harassment and bullying. We have always been honest and sensitive with all our customers and are ready to help. Now our strength is running out, and the pain is too strong. We are sincerely grateful to everyone for their support in this terrible and difficult time for us. Но постойте, вон с тем кремовым (это же кремовый цвет?) платьем призёр питерской пати не обращалась к фирме за исправлением косяков. Это фото из личного дневника клиента. А сапожки Харли разве не в единственном экземпляре существуют? И в них выставлялась кукла фирмы, как минимум дважды. На тот момент это не было браком? А фото шелкового комплекта тоже из личного дневника, на фоне квитанции о возврате посылки. Когда отправленный фирме для замены комплект вернулся обратно по причине того, что его никто не забрал. Да, это мои личные фото, выложенные в личном дайри. И я в шоке, т.к. фирме их не отправляла и использовать не разрешала. Не выдержала. Мы-то все знаем настоящую историю увольнения Котяна и покупки им дефектной куклы. Неужели нельзя было разрулить этот вопрос как порядочные люди? Ведь можно было! Но все эти ушаты говна и клеветы, вылитые на невиновного по факту человека, и попытки извратить факты... это, чёрт побери, подло. Надо ли полагать, что подобное ждёт каждого клиента и... клиента-друга?) Просто фу. Какая мерзость! Обвинение всего ру-сообщества - это просто за гранью. Георг, после такого я слабо представляю, кто тебе руку подаст. Не я - точно. Avi, а не подскажете ли даты заказа и получения на руки этого платья? Интересно узнать сходятся ли эти даты с датами начала работы Котяна на эту простихосподи фирму. Я заказывала через дайри, т.к. пользователь удалился - умылов не осталось и сказать точно не могу. 2017 был у меня сумбурным, поэтому если не ошибаюсь - заказывала в мае, получила в июне. Есть у меня интересное подозрение, что подбор фотографий осуществлялся с помощью известного ресурса, где собирали всё это. Как минимум поиск мест. И да, раз платье брак, не предлагали ли они что-то с этим сделать? Желательно не в стиле парика Феи, конечно. И как они это поняли? Отсылали заведомый брак или пересматривали папочку фоток? Да, фото были и на известном ресурсе в том числе. Мы взаимно не связывались друг с другом. Возможно фирма просто вняла моей просьбе, опубликованной в том же сообщении на дайри, где выложены фото платья. Извини, дорогое ру-бжд сообщество, я знаю, что я всегда админ и мне нельзя выступать от лица «просто юзера» и надо всегда быть корректным и вот это вот все. Но один раз я все-таки не сдержусь, и от себя лично скажу, что это пипец. Апд: да, уже спросили в личке - админке доа напишу, конечно. Да, это уже за гранью. Амадизы, ребят, остановитесь. Уже давно пора остановиться, но сейчас прям нужен «полный назад». Iplehouse & LLT - fan. Дома 14 BJD разной степени собранности. Дети, трансгендеры, пожелания смерти необычной семье и модеры крупнейшего бжд-форума в одном тексте перемешались. Все это еще с чужими фотографиями и расхождениями срокам, озвучили одну швею, а фото с работами как минимум двух. Надо ж было такое насочинять вообще. Вот это эклектика! На ДоА эту муть принесли, а на клабе в своей же теме не появились. Собственноручно себя закапываете, страдальцы. Боюсь, здесь поможет только полный "под зад". Сухая правда и ничего личного. где начинать петицию по полному бану сабжей в рубждсоо? А можно если что на ваши слова про "не связывались" сослаться? Конечно, без искажений, просто история-то крайне показательная - платье, которое у хозяина, фирма считает браком, но ничего не собирается с этим делать. shtuchka, скорее всего, так, но я до последнего верю, что можно исправиться. Ссылайтесь. Тут видите ли палка о двух концах: если фото взято из дневника, то ясно почему не написали, но с какого перепугу взяли? А если с простор анонимных ресурсов - то почему предпочли не связываться? Но в связи с этими событиями (вынос моих фото на доа и ложь, о денежном возмещении) я подумываю сама связаться с компанией. Я ведь клиент, а значит, по заверениям фирмы, имею право на бессрочный сервис. Мне сейчас просто по-человечески обидно. Второй раз уже (первый - за само платье). Проблема в том, что в изделие я уже вмешалась и полностью профессионально отреставрировала. Жаль, что "полный назад" уже нельзя осуществить до тех пор, пока вотэтихребят в хобби в помине не было. Хотя, вдруг смогут! Они умеют удивлять. Одним из главных черных пятен в бжд-хобби всегда были бутлеги, а теперь вот бутлеги и Амадиз Студио. Я в хобби со времен, когда клаб еще не существовал, много происходило за эти 10+ лет, но такого пипца - нет. не в бизнесе, так хоть в чем-то достигли успеха, это достижение, переплюнувшее даже ненавистных вами анонов на ликсах. Очень бы хотелось (так, просто, пожелание), чтобы вы вышли из этого мерзкого травлющего бжд ру-соо, и больше не радовали своим присутствием ни на мини-встречах в Москве, ни на пати. Только вышли - не так, как вы "вышли" из бжд-хобби, а по-настоящему. Как где-то выше писали в комментариях, такой член в нашем соо не нужен. Последний раз редактировалось light 26 фев 2018, 23:07, всего редактировалось 2 раз(а). Настоящее, доброе , вечное - демон. Я не закрою тебя от удара и не ударю за тебя. Просто научу не подставляться. Спасибо за поддержку, у самой такая мысль была. Уважаемые все, от меня сообщения раньше утра не ждите, надеялась написать резюме сейчас, но бессонная ночь накануне провоцирует меня упасть лицом в клавиатуру. Господа закапывают себя так качественно и бесповоротно, как, по-моему, никакие "враги и завистники" не сумели бы.